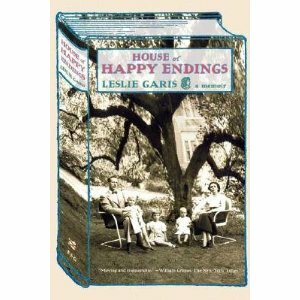 House of Happy Endings is a memoir by Leslie Garis who also happens to be the granddaughter of two people made famous by their own writing of such books as Uncle Wiggily, The Bobbsey Twins, Tom Swift and many others. The author’s father Roger was also a writer, and the book explores Leslie’s relationship with him, as well as Roger’s with his parents. Drugs and depression play a major role in this sad story as Leslie’s father found life unbearable in many ways because of his famous parents. Granddad is drunk, dad pops pills, is in and out of mental institutions, and Grandma is out of her mind. Was it genetic or is he a product of his environment? It is a question without an answer. The well-written story is told through the eyes of a child living in the middle of a maelstrom. It was emotionally difficult for me to read at times because the family was so dysfunctional. I do admire the author for writing out her pain. I could feel it as I read her words. It took a lot of courage for her to share her family’s inner demons with the world. One would think the child and grandchild of people who wrote a treasury of children’s stories would have had an idyllic life. I’ve no doubt this book was Leslie’s healing journey. Sometimes, reading about deeply dysfunctional families, helps us to make sense of our own lives and responses to the world in which we live. This entry was posted in Uncategorized and tagged Books, Garis, Uncle Wiggily. Bookmark the permalink.